Every name consist a story behind its name, similarly 12 districts of Devbhoomi carry story behind its name. District's name is linked with history of Himachal Pradesh and Devbhoomi. Here's story behind name of Districts of Himachal Pradesh, in this post. Himachal Pradesh is most peaceful and beautiful state in India, and is famous for its natural beauty. Shimla is District of Himachal Pradesh. Chamba District was founded in year 920 AD. There was a king of Chamba Raja Sahil Varman. His daughter's name was Champavati. Sahil Burman named district on his daughter's name. Lahaul spiti biggest district of Himachal Pradesh in terms of Area and smallest district in terms of Population comprises of two names Lahaul and Spiti. The district comprises of two mountain area one is Lahaul & other is Spiti. So lahaul spiti got its name on the name of these two tracts. Hamirpur is smallest district of Himachal Pradesh with an area around 1118 km square. Hamirpur named on king Raja Hamir Chand. Solan is one of the district known for Mushrooms and called as "Mushroom City" of Himachal Pradesh. Solan got its name as 'Solan' on the name of Hindu Goddess Devi Shoolini. Shoolini devi is worshiped in Solan and there are several of Devotees of Shoolini devi. Mandi District is second most populated district of Himachal Pradesh. Mandi is also known as "Choti Kashi" of Himachal Pradesh. Mandi was known as "Mandav Nagar" on the name of Great Rishi 'Mandav'. Rishi Mandav prayed in this area, and the rocks turned black due to the severity of his penance. Alternatively , the name may have been derived from common word Mandi which means Market. Bilaspur is second smallest district in terms of area. Bilaspur traces its origin from Rishi Vyas. Earlier Bilaspur was known as Vyaspur. Una district which was earlier known as Jaswan Dun was founded in 1170 by King Purab Chand(Katoch Family of Kangra). Sirmaur are quite a few Sunrises. Sirmaur derived its name as sirmaur being senior among-st the princely hill states. Kangra District is most populated sitrict of Himachal Pradesh. Ancient name of Kangra District as Bhimanagar founded by Pandavs. Bhimanagar was named on name of Bhima. Whereas Kangra got its name from words made of Kaan(Ear) and Gaddha(Create) which means famous ancient Plastic surgeons of region known for Plastic surgery of Royal Families. Kinnaur District is third biggest district of Himachal Pradesh. 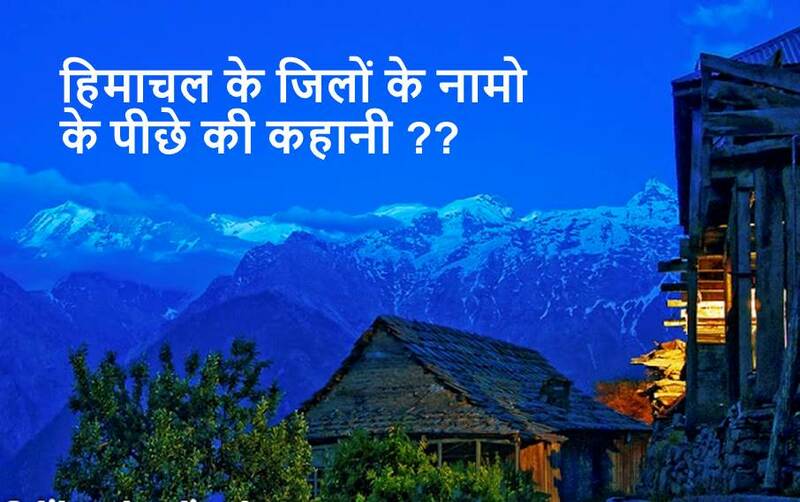 Kinnaur was formed in year 1960 and derived its name from word 'Kinner'. The natives of HP are traditionally referred to as Kinners. Capital of Himachal Pradesh and queen of Hills Shimla got its name on the name of Hindu Goddess Shyamla Devi. One of the Most beautiful district of Himachal Pradesh. There are other evidences in history and literature that confirm that the name of this part was 'kalut' and the letter 'T' was eventually dropped from the name with the time. Thus this place got its present name Kullu. Hope you like our post about story of name of Disricts. Don't forget to share post.